Jesus was raised three days after his crucifixion (if you believe that sort of thing). Thomas Covenant has now been raised three thousand years after his own sacrifice. But where Jesus' resurrection signaled, in the words of a famous scholar, "The Victory of God", Covenant's seems to pave the way for the enemy's victory -- disaster and oblivion. That's Stephen R. Donaldson for you. 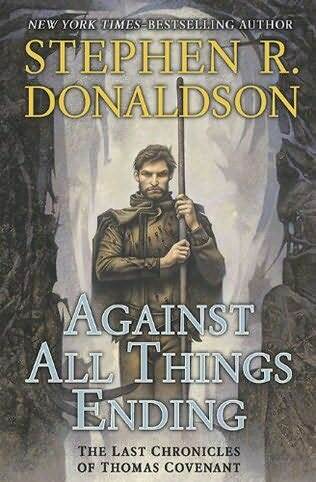 Only a few chapters into Against All Things Ending, the penultimate volume of the Last Chronicles of Thomas Covenant, and I'm thrilling to my favorite author as much as ever. This is The Land, after all, where heroes are self-loathing lepers, rapists, and suicidal depressives, and where even the most promising beacons of hope spell calamity. "Oh, Linden. What have you done?" "Done, Timewarden?" Infelice snapped viciously. "Done? She has roused the Worm of the World's End. Such magicks must be answered. Because of her madness and folly, every Elohim will be devoured." Now, three years after one of the greatest cliffhangers in fantasy literature, comes Against All Things Ending, and in the first chapter we get treated to Covenant's perspective in the very first moments after his resurrection. It's worth citing some of the brilliant writing. I imagine this to be a dark version of the Johannine incarnation/resurrection -- the "white gold becoming flesh". "Thomas Covenant knelt on the rich grass of Andelain as though he had fallen there from the distance of eons. He was full of the heavens and time. He had spent uncounted millennia among the essential strictures of creation, participating in every manifestation of the Arch: he had been as inhuman as the stars, and as alone. He had seen everything, known everything—and had labored to preserve it. From the first dawn of the Earth to the ripening of Earthpower in the Land—from the deepest roots of mountains to the farthest constellations—he had witnessed and understood and served. Across the ages, he had wielded his singular self in defense of Law and life. "But now he could not contain such illimitable vistas. Linden had made him mortal again. His mere flesh and bone refused to hold his power and knowledge, his span of comprehension. With every beat of his forgotten heart, intimations of eternity were expelled. They oozed from his new skin like sweat, and were lost. "Still he held more than he could endure. The burden of too much time was as profound as orogeny: it subjected his ordinary mind to pressures akin to those which caused earthquakes; tectonic shifts. His compelled transubstantiation left him frangible. With every lived moment, fractures spread deeper into his soul. Defying every necessity that sustained the Earth and the Land, he had pointed Linden toward the ineffable catastrophe of his resurrection. "The Worm of the World's End was coming, and it was holocaust incarnate." I'm sure that Against All Things Ending will deliver the usual fever-pitched crescendos with unceasing suspense. Back to reading. I make no promises, Doug. And I never write spoiler-free reviews of films/TV/books anyway (as you know from Doctor Who), because that's the way I analyze things. So it's incumbent on you to shun my blogposts on this subject until you read the book! In all likelihood, I'll be writing only one more related post: a full review of The Last Chronicles so far, and what I hope to see in the final installment in 2013. Finally caught up with you to this point, Loren. Good preliminary review, but one correction. Covenant makes clear somewhere in the early chapters that his sentence at the end of Fatal Revenant was said in awe of what Linden had accomplished, not horror. Although horror would have been an appropriate reaction, Covenant doesn't go there. I look forward to your review of the whole book. For some reason I'm remembering both horror and awe, the first for Linden's initiating the end of all things, and the second for her continually daring to do the unexpected and transcend herself. I'll have to go back and check again. Happy reading! See page 5. I stand by my reading. Good stuff! Looks like you're right and I was conflating Covenant's feelings with those of the Elohim. No doubt because, as you say, horror is the only sane reaction here.